The Bible teaches that justification or saving righteousness comes by faith in what Jesus has done on Calvary’s cross. It is impossible for man to make himself righteous, or for man to save himself. By faith he must accept the righteousness of Christ on his behalf, and by faith the sinner is then declared righteous. This is imputed righteousness. Then as the forgiven sinner continues in a relationship with the Messiah, he or she is given “imparted” righteousness through the power of the Holy Spirit enabling him or her to form a character progressively more and more like the Savior’s. If you maintain your own righteousness, you cannot receive Christ’s righteousness. It is one or the other. It both. It is the obedience of Jesus that is credited to you, the repentant sinner that makes you righteous. You haven’t done anything when you do the things you should have done all along. 5. According to the same verse, what am I saved by? If your righteousness is like “filthy rags”, what does your unrighteousness look like? Grace is defined as “unmerited favor.” You do not deserve it; rather, you deserve death because the “wages of sin is death.” But, because of God’s grace and mercy, and Christ’s death on the cross, you can be forgiven and pardoned. Subsequently, you can walk away free from condemnation of the law. The world “end” is better translated “goal.” The goal of God’s Law is to lead you to the Savior who forgives you and presents you without spot or wrinkle. Salvation is a free gift of God. You cannot pay for this unspeakable gift. If you could, it would require your life. 9. What were the Jews in Paul’s day ignorant of and what did it cause them to do? (Romans 10:3). Many well intentioned individuals are trying to establish their own righteousness. They are trying to be saved by: eating certain foods, wearing particular clothe, returning more than a faithful tithe, preaching to people, etc. The law of God was not given for the purpose of saving you but rather to show you how you have sinned and are in need of a savior. The Savior’s righteousness is never given to be a license to sin. It is extended so that God’s law can be established in the heart of the believer. (See Hebrew 8:10). You may fall into sin, but you have an advocate in heaven, Jesus Christ. He is serving as your High Priest, pleading your case as long as you in sincere repentance turn to Him. Your responsibility is to keep getting up each time you fall. (See Hebrews 8:1-3; Proverbs 24:16). No matter how sinful your life may be; if you allow it, God’s grace will “much more abound” because you need it more. You can’t out sin God’s grace! Jesus said that “All sin can be forgiven” (Matt. 12:31). 16. How do I receive this gift of Righteousness? 17. 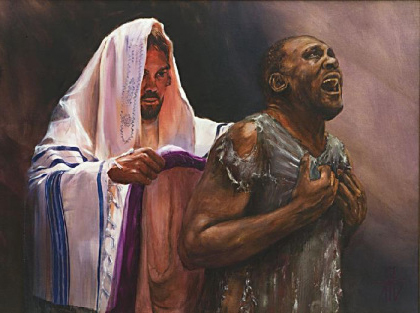 Have you accepted Jesus’ robe of righteousness as a covering for your filthy rags?